Vic, for the record. Another season begins. Another soft defensive team. The punting game has not been addressed. Rodgers is a year older. You’re darn right I’m frustrated. Don’t call 911. You’ll make it. The defense looked alright on the first drive, but the Bears seem to be using the dink-and-dunk offense pretty well. How do teams stop that? Be patient and wait for the tipped pass in traffic. Vic, as a Packers fan, our run defense worries me. As a football fan, I look forward to how our players and coaches will address the run defense. You can’t scheme to stop the run without making yourself vulnerable in the pass game. You have to win up front, and that’s up to the players. If you want the coaches to do it, it becomes a guessing game and Dom Capers better guess right. Does it feel like we are stopping the run? Forte is approaching 100 yards as I’m writing this; he finished the half with 105. I don’t like that. The fourth quarter will tell the tale. Vic, this game will come down to containing Matt Forte. What is happening down there? The Bears are imposing their will against nickel. 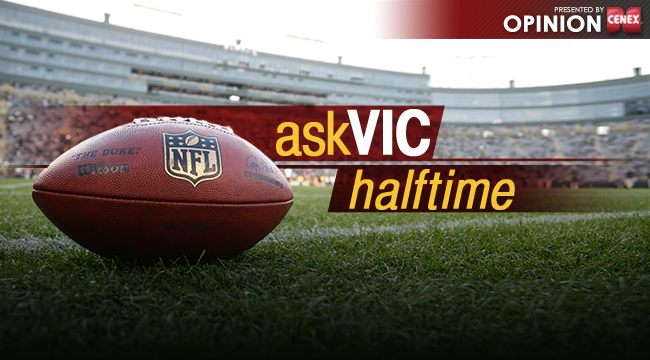 Forte carried the ball 10 times in the Bears’ 15-play, second-quarter touchdown drive. John Fox won’t stop running it until the Packers stop the run. Vic, I feel like panicking, but I know I shouldn’t. What do you think about the defense so far? Despite its failures against the run, it’s given up 13 points. It’s time to score some points. We aren’t doing well in time of possession. I see a tired defense come the fourth quarter. Vic, this game, indeed, has a lot of energy. The Bears look like they shored up on their fundamentals pretty well with Fox. I bet your inbox is already panicked, in September no less. How do you even open it right now? I look forward to your responses. My inbox is in a state of meltdown. It was not prepared to face a 13-10 deficit at halftime. The Packers should be winning by a large margin by now.